Benford, Gregory. 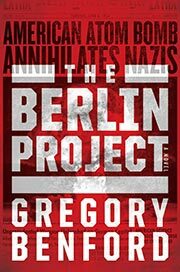 The Berlin Project . Saga 2017. What if: Separation of uranium isotopes via centrifuge was better established when the U.S. entered World War II, and the Manhattan Project pressed forward with uranium-235 production via that method rather than gaseous diffusion. Summary: An alternate history of the Manhattan Project — focusing on the experience of one chemical physicist — which by June 6, 1944 is able to produce a single, but just a single, atomic bomb for use against Nazi Germany. Comments: The main character existed, and decades later became the father-in-law of this novel's author. Published: Saga 2017 (1481487647BUY, 1481487655BUY).